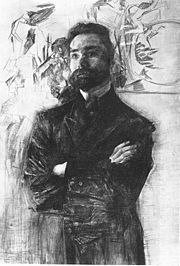 Portrait Of Valery Bryusov by Mikhail Vrubel. Valery Yakovlevich Bryusov (Russian: Вале́рий Я́ковлевич Брю́сов) (December 13, 1873 – October 9, 1924) was a Russian poet, prose writer, dramatist, translator, critic and historian. He was one of the founders and principle members of the Russian Symbolist movement. The movement was inaugurated by Nikolai Minsky's article The Ancient Debate (1884) and Dmitry Merezhkovsky's book On the Causes of the Decline and on the New Trends in Contemporary Russian Literature (1892). Both writers promoted extreme individualism and deified the act of creation. Bryusov shared with them their attitude toward the creative act, and was the first Russian poet to take up the Symbolist cause. However, unlike Merezhkovsky and many of the Russian Symbolist poets who would follow him, Bryusov remained a committed humanist, eschewing the tendency to see the poet as the bridge between the earthly realm and the divine. Valery Bryusov was born on in Moscow, into a merchant's family. His parents had little do with his upbringing, and as a boy Bryusov was largely left to himself. He spent a great deal of time reading "everything that fell into [his] hands," including the works of Charles Darwin and Jules Verne, as well as various materialistic and scientific essays. The future poet received an excellent education, studying in two Moscow gymnasiums between 1885 and 1893. Bryusov began his literary career in the early 1890s while still a student at Moscow State University with his translations of the poetry of the French Symbolists (Paul Verlaine, Maurice Maeterlinck, and Stéphane Mallarmé) as well at that of Edgar Allan Poe. Bryusov also began to publish his own poems, which were very much influence by the Decadent and Symbolist movements of contemporary Europe. At the time, Russian Symbolism was still mainly a set of theories with few notable practitioners. Thus, in order to represent Symbolism as a movement with a formidable following, Bryusov published an anthology of three volumes of his own verse together with A. A. Lang, entitled Russian Symbolists: An Anthology (1894-1985). Bryusov's attempt to inaugurate a Symbolist movement in Russia proved successful—several young poets were attracted to Symbolism as the latest fashion in Russian letters. With the appearance of Tertia Vigilia in 1900, he came to be revered by other Symbolists as an authority in matters of art. It led to his appointment as managing editor of the literary magazine, Skorpion. Then, in 1904 he became the editor of the influential literary magazine Vesy (The Scales), which consolidated his position in the Russian literary world. Bryusov's mature works were notable for their celebration of sensual pleasures as well as their mastery of a wide range of poetic forms, from the acrostic to the carmina figurata. By the 1910s, Bryusov's poetry had begun to seem cold and strained too many of his contemporaries. As a result, his reputation gradually declined and, with it, his power in the Russian literary world. He was adamantly opposed to the efforts of Georgy Chulkov and Vyacheslav Ivanov to move Symbolism in the direction of Mystical Anarchism. Bryusov's worldview remained humanist, but his true belief was in poetry. Though many of his fellow Symbolists fled Russia after the Russian Revolution of 1917, Bryusov remained until his death in 1924. As Symbolism had taken a more spiritual and mystical turn, he was virtually the only major Symbolist who supported the Bolshevik government. He became of member of the Communist Party in 1920, receiving a position in the People's Commissariat of Education of the new Soviet state where he endeavored to train young writers for the regime. He taught at Moscow University and remained a functionary until his early death in 1924. Bryusov was first and foremost a poet. Despite the fact that he helped initiate Symbolism in Russia, his greatest poetic influence was not the moderns, but his Russian predecessors like Fyodor Tyutchev and above all, Pushkin. Like his idol, Bryusov believed in the role of the poet, and wrote numerous poems on the subject. Among his tributes to Pushkin would include his reworking and finishing of Pushkin's "Egyptian Nights." Bryusov most famous prose works are the historical novels The Altar of Victory (depicting life in Ancient Rome) and The Fiery Angel (depicting the psychological climate of sixteenth century Germany). The latter tells the story of a scholar and his attempts to win the love of a young woman whose spiritual integrity is seriously undermined by her participation in occult practices and her dealings with unclean forces. It served as the basis for Sergei Prokofiev's fourth opera. As a translator, Bryusov was the first to render the works of the Belgian poet Emile Verhaeren accessible to Russian readers, and he was one of the major translators of Paul Verlaine's poetry. His most famous translations are of Edgar Allan Poe, Romain Rolland, Maurice Maeterlinck, Victor Hugo, Jean Racine, Ausonius, Jean-Baptiste Molière, Lord Byron, and Oscar Wilde. Bryusov also translated Johann Wolfgang von Goethe's Faust and Virgil's Aeneid. During the 1910s, Bryusov became especially interested in translating Armenian poetry. This page was last modified on 14 January 2016, at 16:13.